Norman Rockwell began his Four Freedoms painting in 1942. His aim was to portray the values we were fighting for in World War II. He offered the paintings to various government agencies, but none of them recognized the significance of this art. 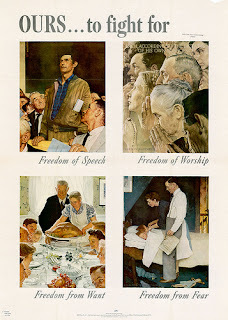 The Saturday Evening Post, for which Rockwell created the cover art, published the paintings on inside pages in 1943. Public response was overwhelming. The 44” by 48” paintings went on a war bond drive to sixteen cities, raising more than $130,000,000 in bonds. Reprints of these paintings found their way onto the walls of the same agencies that had failed to accept Rockwell’s offer.